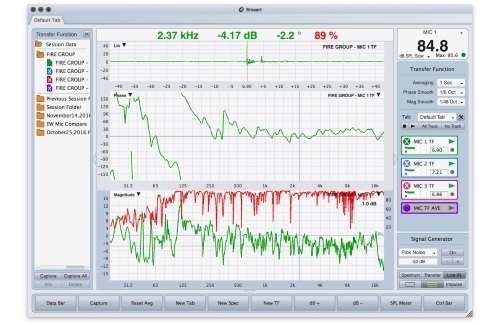 This article is intended for those who have not yet gathered the courage to start using measurement software as a support tool for sound system tuning, be it for lack of knowledge or insufficient encouragement. Here we’ll cover the basics to guide you through the first steps such that the first contact comes out successful and encourages you to keep going. I recommend doing a quick first reading of the text and then going back to the beginning and reading it more thoroughly. Making absolutely sure that there is nothing out of place within a system; that everything is in phase; that all compression drivers not only work, but perform consistently; that there is nothing disconnected, inverted, or with EQ or delay settings carried over from the last event; that our mixing board is doing what it is supposed to be doing… will avoid wasting your time trying to troubleshoot, by using trial and error, why one side sounds different to the other, or why your system does not sound the way it should. While it can be hard at first, once you have practiced the measurement techniques everything goes a lot faster than some of you might imagine. And, once the measurements are done, there is no room for doubts. It goes without saying that the best time for practicing is not while working in an event. This has to be learned when one is not under stress, at a time when nobody is bothering you and you can experiment. I’m sure you will find answers to questions that you always had, and that new questions will arise to which you’ll find answers someday. People that do what we do are curious by nature. In professional sound there exist two types of work that are widely different from each other, even though the same person may have to take care of both in small or medium sized rental companies. One is mixing, where it is the ear that counts, as do musical culture and good taste. Here the person behind the console is one of the musicians, even if not always recognized as such. The other type of work, the one for which this article is written, is system tuning, which is diametrically opposed to mixing a band, and a type of work where our main tools are measurements, and only at the end we can rely on our ears to perform minor adjustments only if the previous work, which is purely technical, was correctly carried out. If you do sound system tuning by ear, you risk noticing a problem mid-way through an event or, what’s worse, once it is over. Or what would be even worse, never realizing it. We should never mix by measuring, nor tune a sound system relying entirely on our ears. Nobody can reasonably justify that acquiring knowledge or using today’s tools is unnecessary. Nobody can convincingly reason that phase aligning subwoofers, or a delay tower, can be done better and faster by ear than using acoustic analysis. So, you will not find a major tour without a systems engineer with measurement software and measurement microphones. And no, major tours will employ nobody to tune the equipment by ear. System adjustment is carried out by personnel who knows the job and the tools that are at our reach today, as well as being affordable by any professional. We need our ears to mix, and add final touches to adapt the system to our taste or our mixing technique, with minor adjustments, once the purely technical issues have been dealt with, after being identified by measuring. As much as we like and intensely live professional audio, our subjective appreciations in a given time and context with respect to the tuning of a sound system may not always match those of the audience, musicians, co-workers, managers, producers … or may not be sustainable over time. Not even the time that it takes for the concert to end. Our measurement software does not lie, nor everything it shows is what it appears to be. The latter does not make it less valuable: we must know how it works and how to interpret it, as we’ll go into detail below. Figure 1: Signal picked up by a microphone. Figure 2: Block diagram of a two-channel FFT based measurement system. The measurement system generates a signal that splits in two at point ‘A’: on one side it is fed to the system that we want to measure (say a loudspeaker, though it could also be a mixing console or an equalizer) and on the other side it goes back into the measurement system. At point ‘B’ a microphone is picking up pressure variations produced by the loudspeaker, which receives the signal generated by our measurement system. So far, we only have voltage variations as a function of time. On one side we have what we’ll call the Reference Signal, which is the original signal generated by our system, and on the other side we have the Measurement Signal, which is the loudspeaker output picked up by the microphone. At both ‘C’ points a Fast Fourier Transform (FFT) is applied to both signals, the Reference Signal and the Measurement Signal. FFT is a mathematical operation that allows for the spectral content of a signal to be obtained from its temporal variation. At point ‘D’ we make a comparison between the frequency response of the two signals and from that comparison we obtain a magnitude and a phase response. It is what we call Transfer Function. At point ‘E’, running the inverse Fourier transform (IFT) of the comparison of the signals, we obtain the impulse response that characterizes, in this case, the measured response of the loudspeaker. Looking at the diagram, we can conclude one important benefit from the use of an FFT-based 2-channel measurement system that we do not have with single channel systems. Since we are comparing the Reference Signal and the Measurement Signal, the type of signal we use does not matter, so long as it contains the range of frequencies we intend to measure. That is, we can use pink noise, a sweep, or music, for instance. One side benefit of the signal comparison is that it eliminates any undesirable effects introduced by the sound card.